What's with men not liking sweets , may be liking but how on earth not overindulging ;) Mini mousse is what i made when we invited some work friends home recently. Made it again today and we clinked clanked our way to a satiated and a happy weekend. 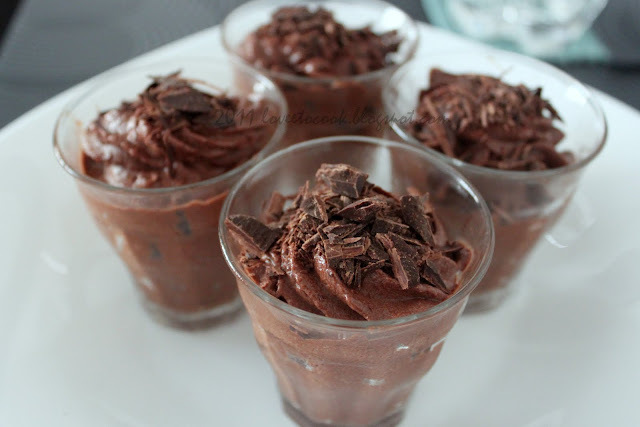 Columbus would have celebrated his discovery of America sometime in retrospect and but I celebrated mine right here right now.. on discovering another guilty sweet tooth beside me ;) Still intoxicated with the flavors , here's the recipe to the luscious little chocolate devil. Put the broken chocolate and butter in a double boiler and mix till smooth. Make sure you don't scald your chocolate. Take the coco powder and espresso, adding 5 tsp hot water to it, stir till dissolved . 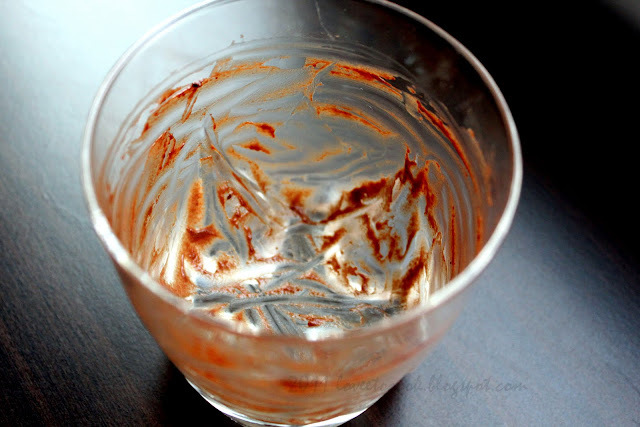 Pour and whisk in the melted bowl of chocolate. Keep aside to cool, approximately 2-3 mins. The coco powder and espresso adds depth to the chocolate flavor making it denser with out the extra calories. In the meantime, take the "chilled" cream sugar and salt - beat with a handmixer till soft peaks are formed (about 10-15 mins, depends on the quantity of cream). Better the chilled and aeration in the cream from whipping, better the mousse. Carefully ladle 1/3 of the whipped cream and whisk in the cooled down, room temperature chocolate mixture. Add the rest of the whipped cream , carefully folding and not whisking (never mixing) it this time, with the help of a spatula- starting at the centre , taking care everything is incorporated and folded well into one. Mostly the mixture at the bottom of the bowl is where u need to keep an eye on, else you will yield a streaky mousse. Folding and not mixing takes full care the aeration in the cream and now the mousse stays intact. Now you can either spoon it or pipe it into the glass /bowl of your choice. I used my mini dessert glasses this time. Keep it refrigerated for at least 8-9 hours before u serve . Works good if u prepare a day in advance. Serve with some chocolate shavings, chocolate flutes or more whipped cream if you like.Recently i garnished it with pomegranate pearls for a bright red against the dark brown. yummmmmmm ... it looks good !! 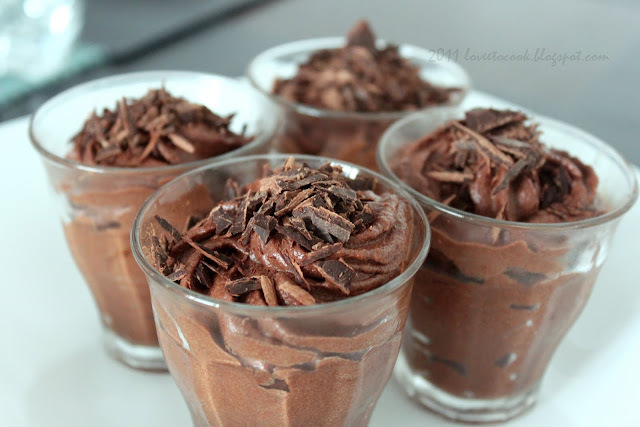 Yum yum... who can say no to chocolate mousse! Looks fantastic. Will try it out soon. First time here .. lovely blog. Following you. Hmmm, yumm! I love the chocolate flavour in it, nice presentation. 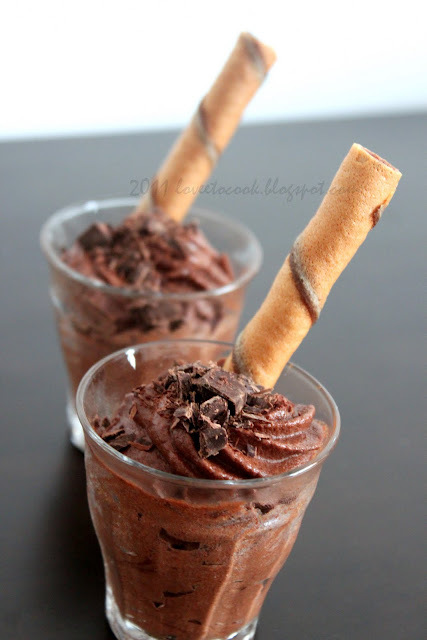 Oh my, these mini-mousse looks decadent and so delightful! The first click just tells me how much it was liked. So yummy and bookmarked right away. Thanks for sharing this. Happy to follow you. Do stop by mine. i have gotta try this one... looks so yum!